Welcome to Day #6 of Chocolate and Mexico Theme Week. Today's Vanuato Kakaw 36% cacao Milk Chocolate bar was made in Mexico City, Mexico, and imported into the U.S. It was smooth, chocolatey, creamy, and had a hint of fruit (cherry, plum). The description on the back of today's milk chocolate bar included information about the historical significance of cacao in Mexico. "...The Olmec people who lived in Mexico and Mesoamerica cultivated cacao..." (thousands of years ago). "They enjoyed a beverage with ground cacao beans, mixed with water and garnished with spices, peppers and herbs...Cacao was a symbol of abundance and was used in religious ceremonies "dedicated to Quetzacoatl—and Chak Ek Chuah, the Mayan patron god of cacao." 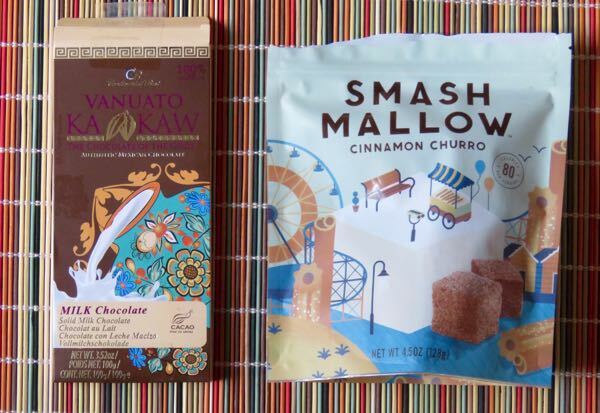 This chocolate was paired with a Cinnamon Churro (Smash Mallow) marshmallow. Both were heated. 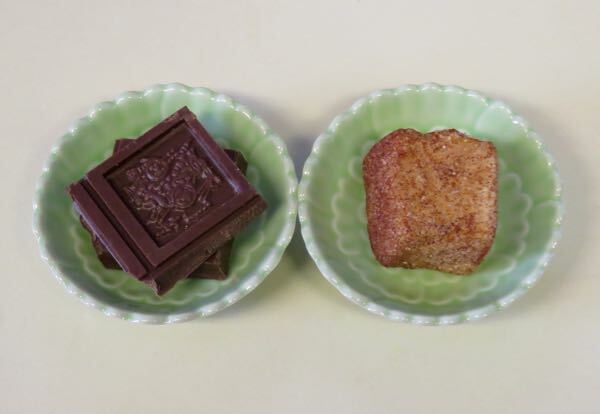 The roasted marshmallow was dipped into the melted milk chocolate.